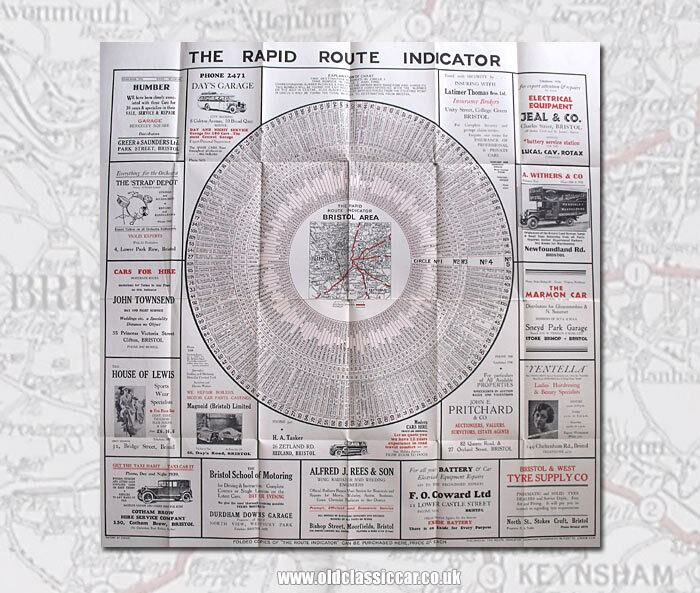 1920s Route Indicator, by Geographia Ltd.
Homepage. 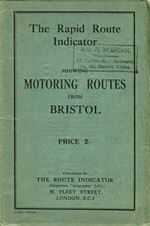 This page: A handy journey planner for motorists in and around Bristol, late 1920s. Drivers in the 1920s couldn't benefit from the myriad of navigational aids that are available today, and had to plan their journeys with precision, especially given how there were far fewer road signs with which to navigate by. Road maps were a must, and for longer journeys many motorists availed themselves of the services offered by the AA and RAC - a motorist would contact their local AA or RAC office, and request directions from their home to whichever destination they required. Someone in the office would draw up a route, then have it typed up, before it was posted back to the member, hopefully prior to their journey being made. Michelin also offered such a service, and an example of such a motor route can be found on this page. Pre-written booklets, such as this RAC publication for the roads in and around Betws-y-Coed, were also available. Just jumping in a car and heading out into the wilderness, making the route up as you went, was not really an option. Maps for cyclists and motorists date back long before the 1920s, the era from which this hails, and I've seen quite a few. What I've not come across before though is this, an example of Geographia Ltd's "Rapid Route Indicator", which in this case was for motorists setting out from Bristol. It is a large publication, the size of a standard road map when un-folded, and probably not something a driver or passenger would want to grapple with while out on the road. Far better to use it for pre-journey planning, rather than while en-route. "Find destination required in circle 1. Take number in circle 2 and find corresponding number in circle 3. This gives the approximate direction and opposite this number will be found the exit road number corresponding with the number on the map in centre. Also places en route with distances from the starting point. In circle 5 will be found the total mileage to destination from Bristol". Below is a close-up view of one small section of the planner, the circled numbers are references to the six numbered routes, marked out in red, on the centre map. Not the easiest of tools to use, but when many people, perhaps new to motoring, had rarely ventured beyond their immediate locality, any suggestion regarding which way to head out of the city was better than nothing, used in conjunction with a traditional map. Test driving the route indicator. For example, to travel from Bristol to Lynton, firstly you find the latter in circle 1. Note the number in circle 2 (82). Find 82 in circle 3. Distances to towns en route are given, as is an indication of the distance away of Lynton, in this case 77 miles (circle 5). Route 4, which heads SW out of Bristol, is the one to use in the centre map. Surrounding the planner are some great old advertisements for local companies, many of which relate to the motor-car and industries that support its use. 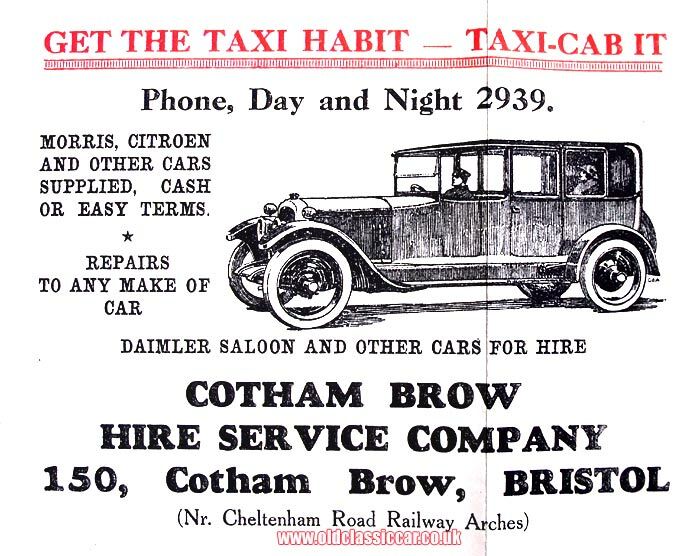 One eye-catching example is for the taxi-cabs available at the Cotham Brow Hire Service Company in Bristol. Cars from Morris, Citroen and Daimler were available to hire, perfect if driving for one's self was all too bothersome (say if one's chauffeur was out of action), or owning a car was simply too expensive. Another promoting the coach tours offered by Day's Garage, in Colston Avenue, features a cracking illustration of a coach party enjoying a trip out. 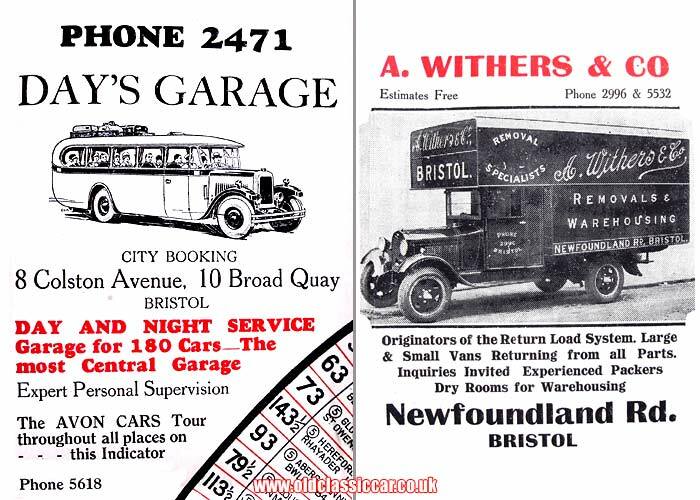 A. Withers & Co. also offers a removals service from their Newfoundland Road base. Interestingly they quote themselves as being the originators of the return load system, where lorries which would otherwise return from a destination empty, are linked up with people wishing to ship from that location, back to the lorry's original departure area. More period items relating to old vehicles can be found in the Motoring Collectables section of oldclassiccar.co.uk. Included is a 1950s-era mileage calculator, another method of calculating distances between two points on the map.